Planning a Greek cruise? If so, you probably have images of the islands dancing through your head. The beaches too. It’s to be expected. Greece is a fixture in our pop culture and has definitely earned its travel bucket list spot. But what’s a Greek island hopping cruise really like? And is it OK to bring the kids? Welcome to a throwdown as expectation meets reality. 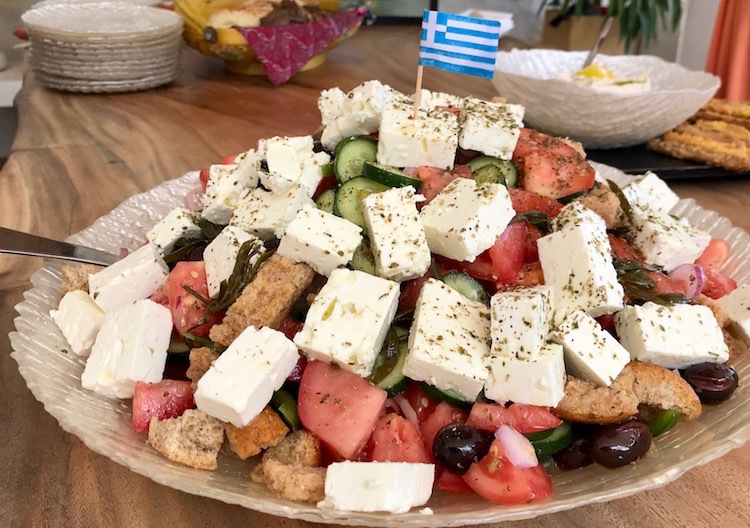 If you’re planning a Greek island cruise, you may have expectations about the cruise experience, the islands and the food in Greece. I know I did. But what you’ll actually experience may be totally different than what you’ve imagined. It was for me. 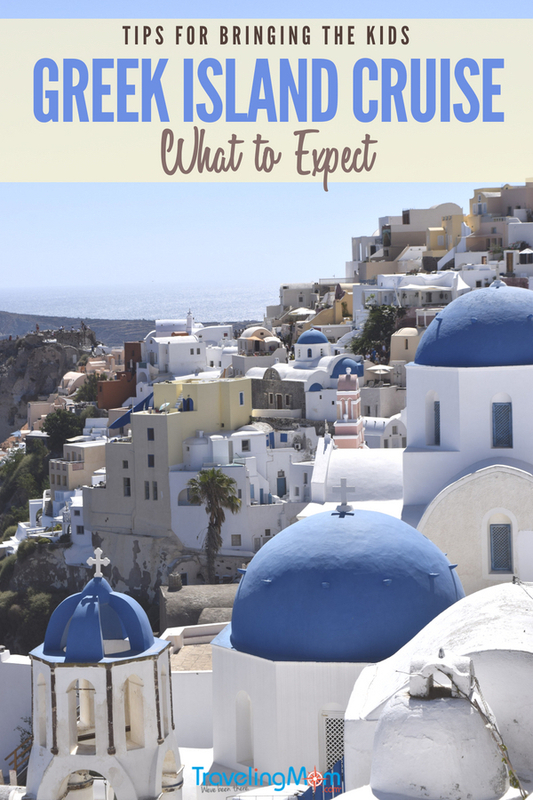 Here’s a rundown of popular Greek cruise expectations vs. the reality I experienced, along with advice to help you make the most of your time in paradise, including tips for bringing the kids. The Greek islands are grouped into different families, including the Sporades, Dodecanese and Cyclades. Visitors can island hop using the country’s extensive ferry system. But who wants to check timetables, book a number of hotels and schlep luggage on holiday? Not this gal. Booking a Greek cruise resolved those pesky logistics issues so I could sample a variety of different islands in a Goldilocks-like attempt to find an island that would fit me just right. The only problem? I’m not a big fan of cruising. I’d only taken two cruises before, on large Royal Caribbean and Princess ships. So I expected the same on board experience. Although those ships were huge, they felt crowded to me, especially the buffet restaurants and pool deck. The big ships I experienced featured Broadway-like shows in huge theaters, noisy casinos and daily entertainment schedules that kept the cruisers very busy. Too busy, in my opinion. I felt like I was in Vegas, with a view. I resigned myself to enduring a lot of hubbub on my Greek island cruise for the convenience a cruise ship offered. 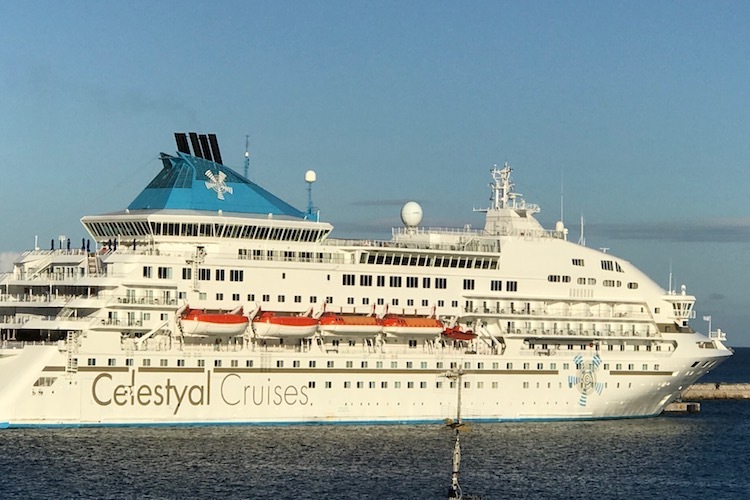 Rather than booking a big ship with a major cruise operator, I traveled aboard Celestyal Cruises, a Greek-based company. Celestyal has a fleet of mid-sized ships (approximately 1200 passengers) and offers 3-, 4- and 7-day Greek island cruise itineraries. The difference was immediate. I didn’t need to leave bread crumbs to find my way back to my cabin. It only took a few hours to make the acquaintance of the friendly bartenders and servers. The evening shows on board featured a troupe of talented Cuban performers and the performance venue was an intimate lounge with banquette seating. Because the ship is older, many of the public spaces have a funky, retro vibe. My primary fear was that I’d feel claustrophobic in my cabin since it didn’t have a balcony like I’d had in the past on larger cruise ships. But it wasn’t an issue, thankfully. My cabin had an enormous window and a practical layout with two twin beds, a couch and plenty of storage. 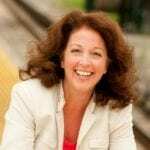 TravelingMom Tip: If you enjoy the go, go, go style of big ship cruising, you might be wondering how to deal with the laidback atmosphere on a smaller ship. My advice? Embrace it! If you’re traveling with kids and you’re worried about them getting bored, come prepared. Bring a deck of cards or travel-sized version of a board game like Scrabble and stake a spot on the lido deck. Keep score over the course of the week and crown a family champ at the end of the cruise! The Greek islands are an ideal destination for couples, routinely appearing on “Best Places to Honeymoon” lists. The scenery is gorgeous, the beach season is long (June-September) and the sunsets can’t be beat. Hubby and I spent quality together time exploring the ancient Greek ruins. Then we’d return to our comfy cabin, freshen up and retreat to the aft deck bar, settle into seats and watch the sun paint each harbor while sipping ouzo, the Greek national drink. Perfect? Yes. I’d say so. Our Celestyal cruise ship had a surprisingly large number of children on board, ranging from elementary school age to high schoolers. And there were smiles all around, particularly from the American teens on the pool deck, mingling with their international counterparts. Apparently you don’t need to be bilingual to flirt! I talked to a number of parents, wondering what brought them to the islands. One mom and her daughter decided to leave dad at home to handle a home renovation. Another mom and her two sons were traveling with a large family reunion group. They offered the following advice, based on their experience. Bring Lanyards. Cruise guests are given an id card when boarding. It’s your room key, and needs to be presented when ordering food and drink and when leaving and returning to the ship. If you don’t want to spend your entire cruise looking for misplaced cards, bring lanyards for the kids (and grownups!) to wear. Don’t Fret the Food. Cruises work well for picky eaters because there is almost always something in the buffet restaurants that they will eat. If you prefer to eat in the dining room on board, ask about kid-friendly options. Our cruise offered spaghetti and chicken tenders with fries. Take Advantage of Onboard Activities. Our Celestyal cruise offered karaoke, bingo, trivia and Wii competitions. All were wildly popular with the kids. And check out the kids’ club, if there’s one onboard, like on our ship. I spoke to a mom of 2 boys, 7 and 11, who liked the club. She and her husband were able to use the gym one day one the boys learned how to make origami. Book Excursions that Include Beach Time. The Greek islands have many important archaeological sites to explore. It’s fun for kids…to a point. Balance the sightseeing with plenty of beach time for the kiddos. The beaches we explored on Crete, Syros and Mykonos were full of families enjoying the warm air and cool waters. I expected wide, soft sandy beaches like the Caribbean, but they’re not. They’re pebbly, so water shoes are a really good idea. Take a minute and imagine Greece. Freeze the image in your head. If you see whitewashed buildings, cobblestone streets, impossibly blue seas and billowing fuschia bougainvillea, you’re picturing Mykonos and Santorini. For years I’ve wanted to book a villa on either of the rock stars of the Greek islands – Santorini and Mykonos – and spend a week soaking up the sun and exploring the tavernas, beaches and sights. 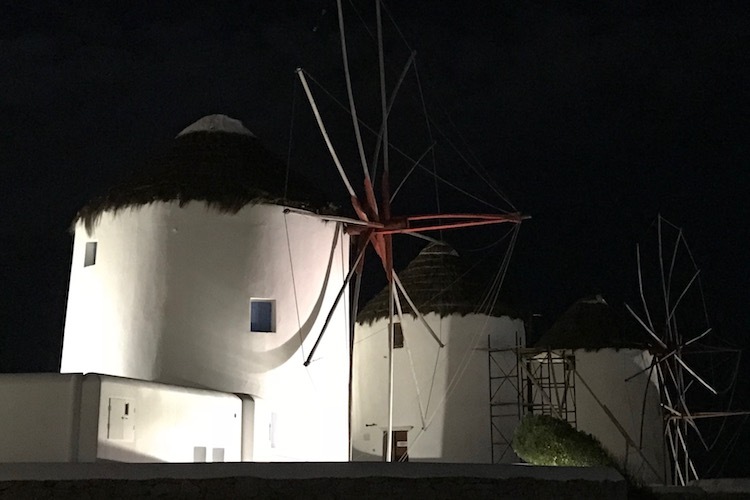 In pictures, it always seems so perfect and lovely – the charming windmills in Little Venice and Santorini’s blue domed churches. I’d take leisurely walks, snap a million pics and enjoy romantic sunset dinners. Reality #3: The Popular Islands are Crowded. Really, Really Crowded. During the summer, thousands of tourists flood Mykonos and Santorini, straining resources and testing patience. The Greek government limits the number of cruise ships permitted to dock each day, but it is still very crowded. Take a deep breath before wading into the stream of people wandering through Oia, Thera or Little Venice and be prepared to wait in line to snap your photos. You can escape the crowds. 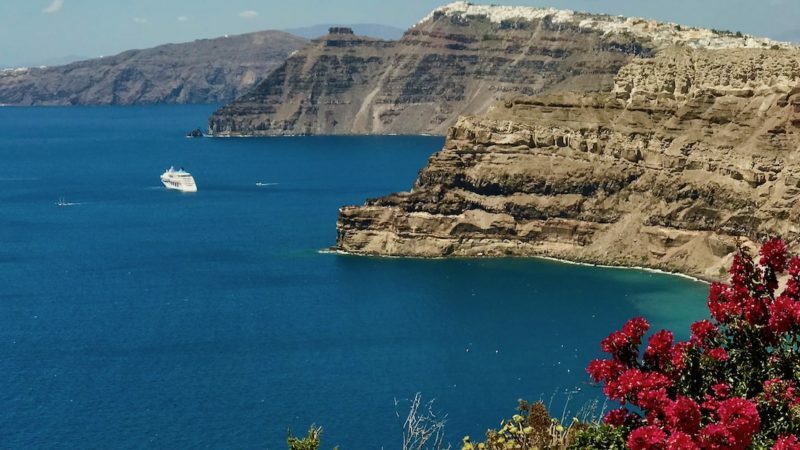 Look for excursions on Santorini that include stops outside of Oia and Thera. We enjoyed a lovely visit to the Venetsanos Winery. It’s got a breathtaking view of the famous caldera and we had the place to ourselves. And, in Oia, after I dragged my husband into a few boutiques, we slipped off the main street and sat at a delightfully shady restaurant table with a great view and cold beer. If you overnight in Mykonos like our Celestyal Cruises ship did, go into town late. Mykonos at night is one of the prettiest places I’ve ever seen. The narrow cobbled walkways of Little Venice sparkle with light reflecting off the white-washed walls. Go down to the bars along the harbor and get a table next to the water. You can enjoy people-watching from a distance! TravelingMom Tip: If you end your day in Santorini in Thera and need to ride the funicular down to the port to catch a tender back to your ship, don’t wait until the last minute. The lines get really long and you don’t want to lose your happy island vibe worrying about getting stranded. If you’re familiar with Greek mythology, the gods are a tempestuous bunch. They sometimes like to wreak havoc with the lives of mortals. During our Greek island hopping cruise, the winds blew too strong to permit us to disembark in Milos, one of the scheduled island stops on our Idyllic Aegean cruise (Crete and Samos were the other Greek islands on our itinerary and Kusadasi in Turkey was an option for those guests interested in touring Ephesus). A collective wail sounded on the boat when the announcement was made. 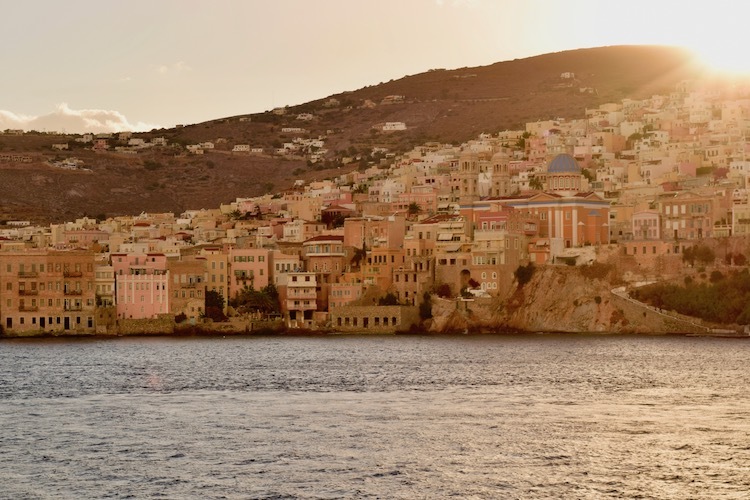 Most of us were unfamiliar with our new destination, Syros. The crew quickly pulled together fresh itineraries and distributed fact sheets about the island to the guests. And it ended up that a sour lemon situation turned into the sweetest pitcher of lemonade. Syros is the island capital of the Cyclades. Instead of familiar whitewashed Cycladic buildings like those on Mykonos and Santorini, Syros boasts a Venetian architectural landscape, like Italy’s Cinque Terre. 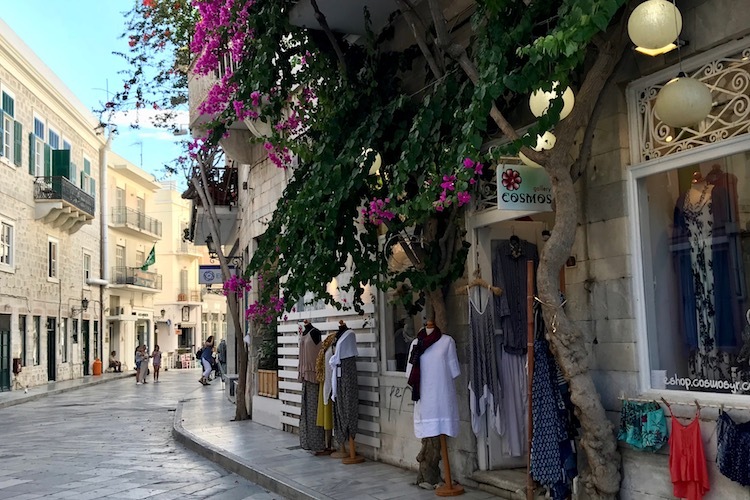 We went ashore in Ermoupoli, Syros’ bustling main town. The streets in heaven may be paved with gold; in Ermoupoli, they’re paved with marble. And they’re lined with fantastic boutiques, a real treat for the shoppers in our group, me included. Prices in Mykonos were jaw-dropping and they were even higher in Santorini. But in Ermoupoli, we found some terrific bargains, including a pair of snazzy black leather sandals for 20 euros that fit me perfectly! Score! I really enjoyed taking a leisurely walk around Ermoupoli. Miaouli Square is a lively park-like spot for people-watching directly in front of the city hall. A must-see is an early painting by El Greco, tucked away inside a tiny church off the main shopping drag. And the beaches on Syros are superb. 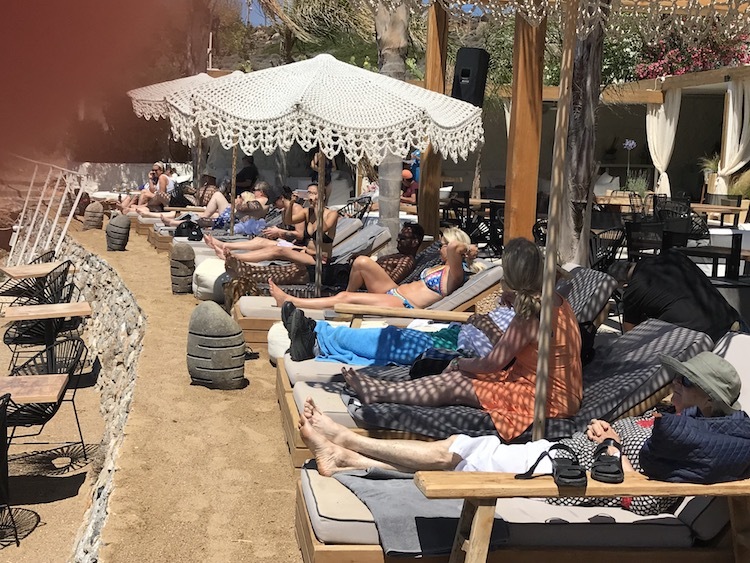 I fell hard for the Greek beach club concept. You rent a shaded beach bed. Kind, attractive servers bring you food and cocktails. And, when you feel a bit warm, you dip into the Aegean. It’s a cycle worth repeating over and over again. You Want Me to Eat WHAT?? As a kid, I had a fairly limited number of foods I would eat. I existed primarily on Fluffernutters and spaghetti with butter. Fortunately, I grew out of it and now will eat most anything that lands on my plate. But my experience with Greek cuisine is very limited. As for my husband? He’s not very adventurous when it comes to food. I’ll admit I was concerned about Greek cuisine. My experience is limited to American interpretations of Greek dishes. I’m a fan of NYC street versions of gyros and Greek chips and dip (deep fried zucchini slices and tzaziki). What if I didn’t like the food and had to beg local restaurant owners for hamburgers? I never want to be that American overseas. My husband and I ate many of our lunches off the ship at local tavernas and beach clubs. The flow of the meals was similar; a series of mezzes (family-sized platters) were presented followed by a main dish with a sweet treat to close the meal. That sweet treat was often slices of locally grown watermelon. Did you know they grow watermelon in Greece? Me neither. The mezzes always included a traditional Greek salad featuring feta and tomatoes. You’ve never truly tasted a tomato until you’ve had one in Greece. When I came home, I looked at my backyard garden and sighed, knowing my produce would never taste the same. On board Celestyal, we ate our dinners in the main dining room. The daily menus featured Greek specialties every night. Try as I might, I butchered the pronunciation mightily when I ordered them, but the friendly servers never seemed to mind. When I’ve visited Greek restaurants in NY, I’ve stuck to familiar favorites like stuffed grape leaves. Because of my cruise experience, I have the courage to try something new on my next visit! You might be wondering…what about the fish? I know it was a question on my husband’s mind. And, when the first platter of octopus was passed to him, I could feel his discomfort. Fortunately, it only lasted until the first bite. 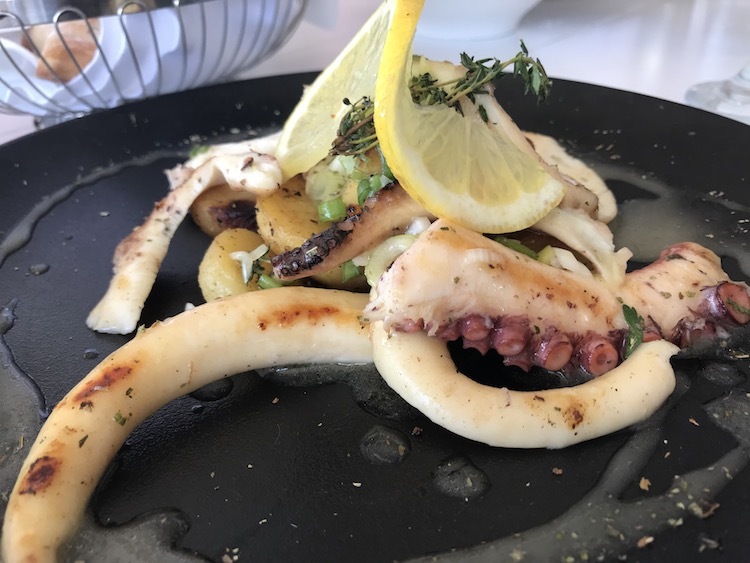 Prepared by experts, freshly caught octopus is a sublime taste sensation. We enjoyed it served in slices, rings and matchstick-style. It has a very mild taste, enhanced by lemon, salt and pepper. 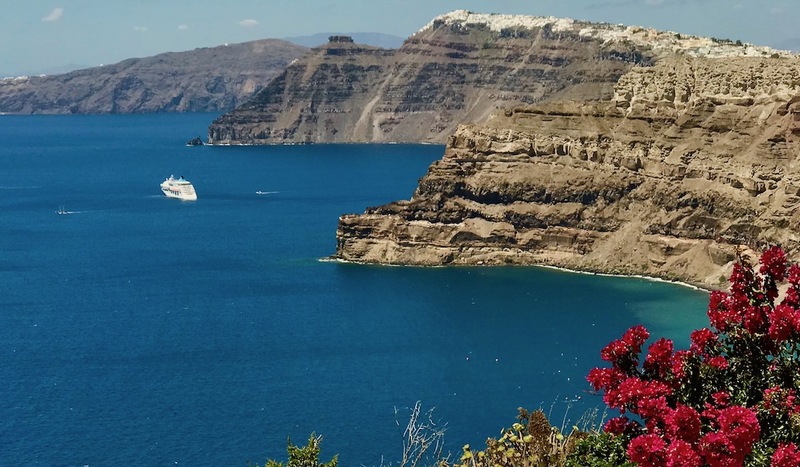 Visiting the Greek islands is a bucket list adventure and touring the islands on a cruise is a convenient way to sample several islands over the course of a week. 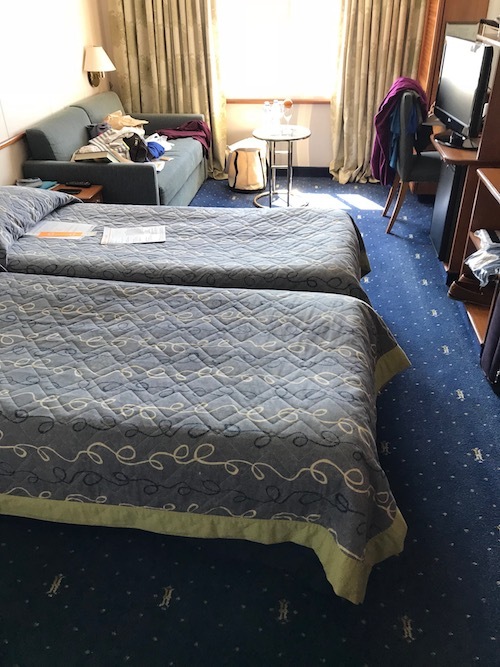 Although I didn’t expect to enjoy the cruise experience, I really liked having a comfortable place to return to at the end of each day. Each of the islands we visited had a unique charm to them. Instead of falling in love with one, as I expected to, my Greek cruise whet my appetite to return and taste more of them. Corfu in the Mediterranean Ionian Islands, reportedly has amazing sandy beaches. And Rhodes is rich with archaeological sites. Speaking of appetites, I was thrilled to discover how much I like Greek food and the way it’s served, mezzes-style. I’m going to round up some recipes from my Greek friends and plan a party, with plenty of ouzo! If you’re planning a Greek island hopping cruise, you’ll definitely have great expectations. If you’re lucky, the reality will be even better than anything you imagined!